Roof venting is designed to prevent hot air and moisture from getting into attics. There’s a great variety of vent types that are created to perform similar tasks. However, each vent type is different from the other. This leads us to the most common question asked, when talking about roofing vents: what IS the “best” roof vent? For starters, we have to all realize that all homes are not manufactured the same way. A certain type of roof vent that may work for you, may not work for someone else. How can you determine which roofing vent is the right choice for your new roof? The “best” roof vent for your home is one that removes attic air space the most efficiently. Below are a few types of vents to help make your decision a little easier. Wind turbines (also known as whirly birds) have moving parts but are not static. They do not have motors because they are solely operated on the wind to power their movement. This type of roof venting draws up the hot air and moisture from the attic once it’s in spinning action. Box vents are installed over a hole that is cut out of the roof. They are known for having no moving parts. Box vents have a natural convection, which means that they can create an opening for the moisture and hot air to release from. Other names that box vents refer to are louvers, flat vents, turtle vents or low profile vents. Off ridge vents are often confused with box vents because of the simple fact that they function similarly. 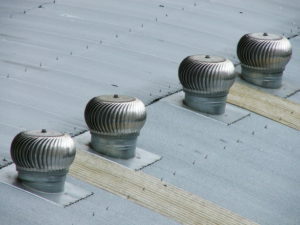 These static vents are placed near the ridge, over a roof section that has been cut off. Off-ridge vents differ from box vents in this matter: instead of being square shaped, they are long and thin. Although off ridge vents help to prevent the moisture and hot air from the attic, this type of vent is not the most effective. Need Help With Roof Venting? Now that you know the difference between roof vents, the question that now lies is: which type works best for YOU? Serving in the Howell, Brighton, South Lyon and Fenton area for over 20 years, Eastbrook Construction is the roofing expert. We make sure that our customer’s satisfaction is our top#1 priority. Let us help you choose the perfect fit for your home. To request information on proper ventilation when getting your new roof installed or if you have questions on vents for roofs, please contact us. 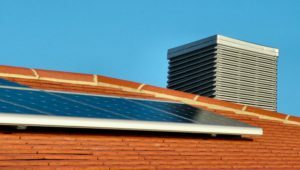 This entry was posted in New Roof, Roof Venting and tagged help with roof venting, proper roof ventilation, types of roof vents, vents for new roof, wind turbine or box vents. Bookmark the permalink.